Enjoyable central hangout, whose diner-style range of burgers, hot dogs, pizzas and chargrill steaks set it apart. This part of South Bridge has traditionally been something of a dead zone for bars, but the Whistle Stop Barber Shop has confidently challenged that perception since its opening in 2015. More compact than it looks from the outside, the bar has a modest amount of booth and table seating for eating, decent standing space near the bar and a mock barber’s shop in the basement. 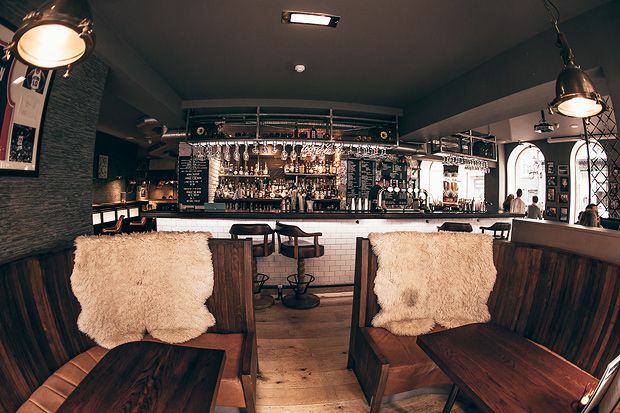 If you’re popping in for after-work drinks you’ll find a good range of craft beers and an excellent cocktail list themed around an eclectic list of American celebrities (but would anyone want Woody Allen pouring their drink?). The food is equally in hock to the US of A, with the flagship burgers including a hot chilli cheese ‘Triple Threat’ and a mac n cheese-topped version. Steaks come in a range of cuts and there are a variety of fries including cheese and gravy-topped poutine. With hot dogs, nachos, wings, pizzas and inventive sharers including a Philly egg roll, this is a recommended burger joint in a city awash with them. Notable dish: 'Rowdy Roddy Piper' beefburger with haggis, smoky bacon, spring onion and whisky sauce. Live entertainment: Occasional live music on Sun night.